As it turns out for us, having two kids does not mean we achieve economies of scale especially in the department of big-ticket items. We now require additional cot, carseat and stroller for #2 because my #1 has not outgrown them yet. With TWO very young kids, it is suicidal (for us) to want to juggle them plus all the stuff we need to bring out with just TWO pairs of hands. There are the additional baby-chores that come along with another baby as well. That is why we need to get a maid to help us out here. And because we now need to have space for the maid, TWO carseats and TWO strollers, we need to have a bigger car as well. Can we hear a resounding *KACHINK* ?! Hence, despite knowing the crazy snaking queues at Mothercare’s VIP Preview Sale, we went to check out what we may need. We braved the crowd and queued for a good one hour before getting into the store. Sigh, the things we do as parents. Because of that, the husb declared that we MUST get something after queuing for so long. And we did. We got a cot bed and spring mattress (which costs about the same as the cot bed!) for Thaddeus. That’s one of his first-born perks for him. He gets all the upgraded stuff. 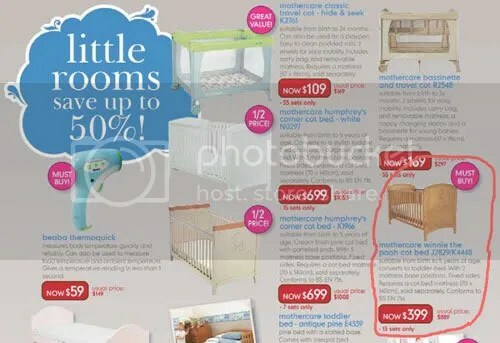 Because he’s bigger and definitely need a cot bed sooner than dragonlady, he will use the cot bed while his babysis takes over his cot.